Fall weather as winter is just around the corner. 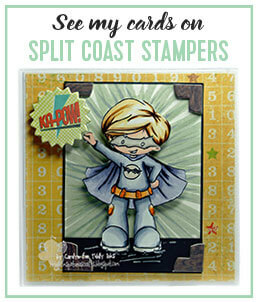 Today I am sharing a card featuring a new stamp! Isn't this cute? It's called Witches Magic and is available now in the store. So how did I make my "night" image. I stamped the image on black paper with StazOn white ink. I then used Prismacolor markers to color it up. I especially liked how the metalic silver turned out. Don't forget to check back daily for more inspiration!